QUALITY GUN CLEANING MAT - This AK-47 gun cleaning mat by TekMat is made to exacting standards. This begins with the waterproof, scratch proof, fade and oil resistant dye-sublimation printing. LARGE, CLEAR DESIGN - This AK-47 gun cleaning mat measures 12" x 36" and is 3mm thick. It gives you plenty of room to disassemble your AK-47 long gun and to clean it without having to move parts all over. 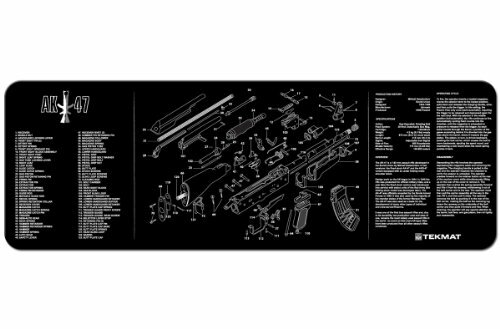 EASY TO USE - This AK-47 gun cleaning mat comes with an overview of the history of the AK-47 as well as a simple to follow parts diagram that make up your AK-47. LIFETIME QUALITY - Designed in Salt Lake City, UT this AK-47 gun cleaning mat will last a lifetime and will always be a great accessory to your AK-47 long gun.